Make it bigger and more powerful, and give it a big, fat battery and screen. Apple is used to criticism from PC partisans, but with its first major redesign to the MacBook Pro line in years, it found itself unexpectedly taking fire from its own fan base. The new laptop was underpowered, Mac users complained, lacked ports that people actually use, had low-to-zero serviceability, and that “improved” butterfly keyboard still wasn’t that great. The point that seems to uniformly burn pro users is the maximum amount of RAM: just 16GB of LPDD3/2133. The reason for the limit? Apple said it saves power, which lets them make the MacBook Pro thinner. I won’t pass judgment on that decision (though I think PC makers are also too concerned with thin sometimes), but I will say there’s a pretty easy way Apple could satisfy its unhappy performance-minded customers: Bring back the MacBook Pro 17. Yes, Apple once sold a giant 17-inch MacBook Pro, which it discontinued in 2012. Five years on, it's even easier to build a powerful laptop than it was back then. Bringing back an unapologetically big, beefy MacBook Pro 17 could be just what Apple needs to make its laptops great again. Here's what we'd put in it. 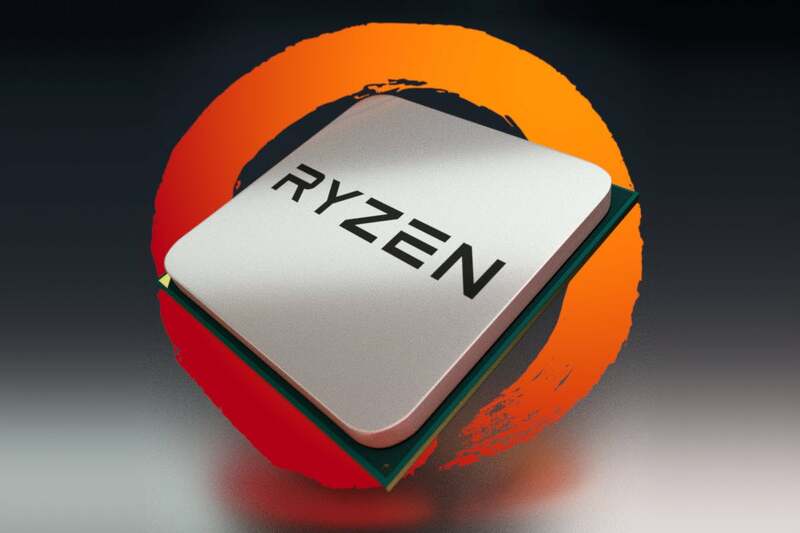 Could a Ryzen make its way into a future MacBook Pro? The Macbook Pro 17 should have a high-end Intel or AMD-Ryzen-based quad-core at a minimum. People say CPU performance doesn’t matter, but it does. The crowd that would actually buy and use a portable workstation needs to get work done. This means a quad-core or more. While it wouldn’t be a first—PCs have sporadically been available with six-core CPUs for years—Apple could cause much jealousy if it scored access to a low-power version of a next-gen Intel or AMD CPU with more than four cores. I think people looking at the MacBook Pro 15 should pony up for the higher-end Radeon Pro 460, because the entry-level GPU is a bit underwhelming on pure horsepower. Yes, it’s great on power consumption, but more performance on a primarily performance-minded laptop is generally better. For the MacBook Pro 17, Apple should look into a higher-wattage GPU that gets it into the GTX 1070 class. That doesn’t mean Nvidia-only, as AMD is expected to launch its next-gen Vega GPUs this year. The point is to go for the gusto with a hotter, more powerful chip. A fat GPU isn’t just about gaming: GPUs today handle video encoding and a spate of compute-based tasks. Giving up some thinness or battery life to accommodate a faster GPU would pay real dividends. Using standard DDR4 SO-DIMM modules would cost battery life, but at least allow a MacBook Pro to hit 32GB or more. Apple’s decision to use LPDDR3 rather than DDR4 was driven by the company’s decision to make it thin. The company says it did it to save power, because LPDDR3 uses less than plain old DDR4. Apple could have used DDR4 like everyone else, however, and just put in a larger battery to accommodate it. An added bonus: more RAM. 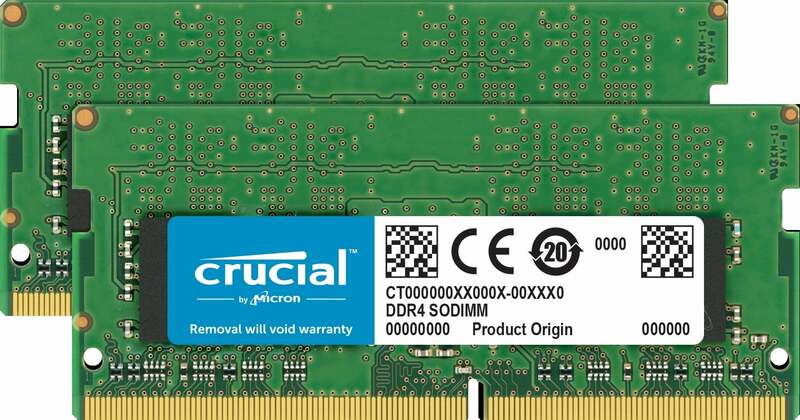 The largest LPDDR3 RAM modules that work with Skylake CPUs (such as in the MacBook Pro) accommodate just 8GB of RAM, while those for DDR4 can take up to 16GB. 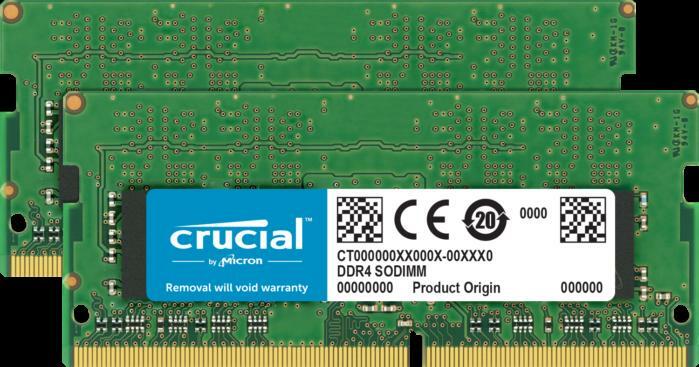 Had Apple gone with DDR4, its two RAM modules could have given users a nice 32GB of memory. To be fair to Apple, no previous MacBook Pro has hit the 32GB mark either, but clearly the backlash says customers want more. The cost, on paper anyway, doesn’t look that bad: While LPDDR3 has a sizable advantage in standby power consumption, active use shouldn’t cost more than 5 percent to 10 percent, according to Intel. 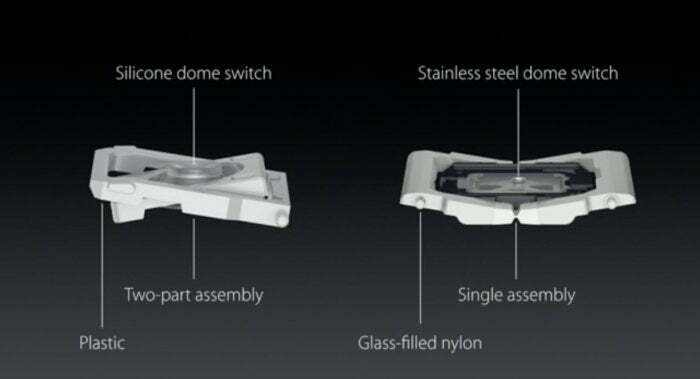 Either way, it’s clear that Apple’s customers want a laptop that offers at least 32GB. One area you can’t kick Apple for is storage performance. The company makes its own SSD controllers and they cook, with OS X-based storage benchmarks posting 3GBps reads and 2GBps write range. If we were to be downers, though, we’d say NVMe PCIe M.2 drives offer similar performance, and they work on an industry standard. The one improvement we’d ask from Apple is to follow industry standards on the MacBook Pro 17. Oh, and because the chassis will be larger—offer the option of two M.2 drives, and maybe even a 2.5-inch drive for bulk magnetic storage. 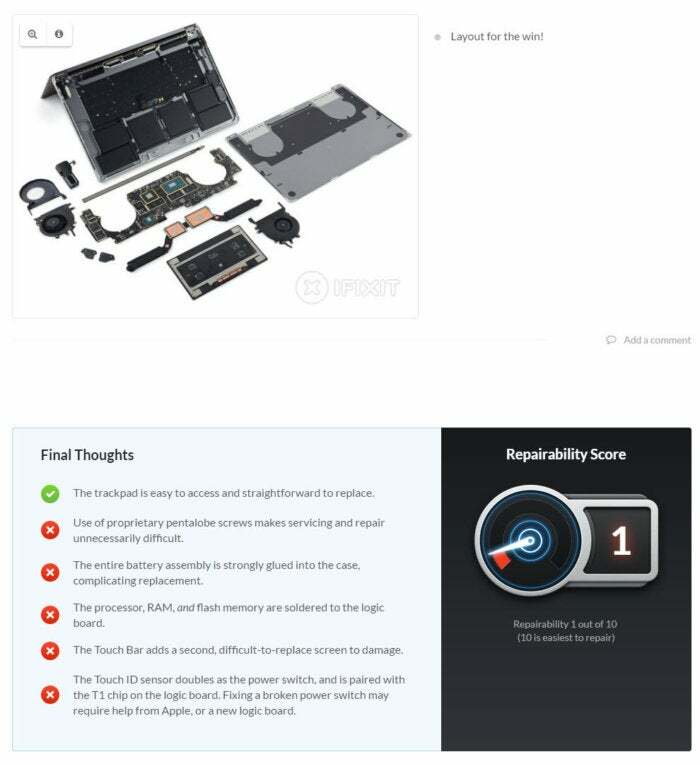 iFixit says you can fix the trackpad, but the rest of the MacBook Pro 15 is a lost cause. I’m not sure, but I think iFixit gave the new MacBook Pro 15 a negative-1 in serviceability. OK, I’m kidding, but iFixit did give it a 1, which might as well be a negative-1. Not only is the RAM soldered to the motherboard (which has been the norm for superthin Ultrabooks for some time), but Apple has now chosen to weld the SSD’s chips to the motherboard too. While some don’t think that’s a big deal, consider that the GPU, CPU, RAM, and NAND are all mounted to the same board. If any of those items failed, you’d be looking at replacing all four. In warranty, that’s not a big deal. Out of warranty, you might as well throw it away. The most green policy Apple could adopt is to offer upgrade- and repair-friendly designs rather than pursue thin, disposable designs. That means following industry standards as much as possible. More ports would be great on any future MacBook Pro. One weakness of the MacBook Pro 15 is clearly the number of ports, and further, the lack of port diversity. The laptop gives you four USB Type C / Thunderbolt 3. Period. With the AC adapter in one port and an external monitor in another, you have two ports left. Plug in your Logitech adapter for a mouse and keyboard, and you now have one port left. Plug in a gigabit ethernet adapter, and you’re done. You now have to constantly pull devices to plug in a card reader or USB thumb drive. And you’ll need dongles for sure. USB Type C is great, but it ain’t that great yet. Apple may be showing more of that courage by dropping USB Type A, but it’s an overreach. 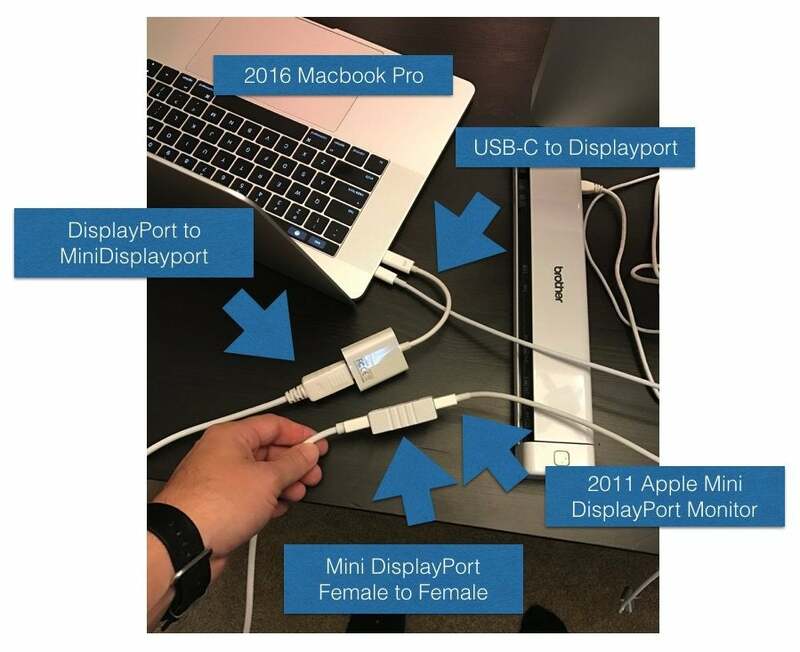 So please, Apple: On the MacBook Pro 17, give everyone a couple more ports, and the diversity of port selection that the MacBook Pro line has always been known for. In its pursuit of thin, Apple actually reduced the size of the battery in the MacBook Pro 15 from the previous model’s by almost 25 percent. The good news—and something Apple doesn’t really get enough credit for—is the company managed to keep battery life rather good for a quad-core, 15-inch laptop, with 9 hours of video run time. But here’s the thing: A bigger battery means more run time. Would a quarter of a pound really have killed MacBook Pro 15 users? Who knows—but on the MacBook Pro 17, it’s about performance and battery life, so go all the way and drop in the maximum 99.5 watt-hour gas tank. Apple’s Butterfly key design isn’t as good as the design of previous keyboards. The last feature Apple should put in the MacBook Pro 17 is a real Apple keyboard. You know, the kind of keyboard that let every MacBook user say with an air of superiority why Macs are so much better than PCs. That’s quite a turnaround. For the MacBook Pro 17 to make Mac laptops great again, the company needs to return to the real Apple keyboard.